We’ve all had that morning. It’s ten minutes past the time when your last alarm of seven was supposed to wake you up and you’re just now scrambling to get out from under the covers. You knock your dog off the side of the bed in your rush to the bathroom to brush your teeth and dot on some concealer to hide the bags under your eyes. You catch a glimpse of yourself in the mirror as you’re shimmying on a pair of pants – you can’t leave the house with hair like that. amika’s new line of highly effective, time-conscious heat styling tools and hair products take the stress out of your morning routine. The Fluxus Touchable Hold Hairspray works hard to keep your style in place without sacrificing flexibility. It’s secret ingredient is Sea Buckthorn Berry – also known as the Obliphica, which has powerful nutrients to not only fortify hair but protect it as well. Because of this, you can use this spray both before and after styling to protect hair as well as lock in your style. This non-sticky formula allows you to brush through your hair even after spraying it, making it the perfect morning go-to. 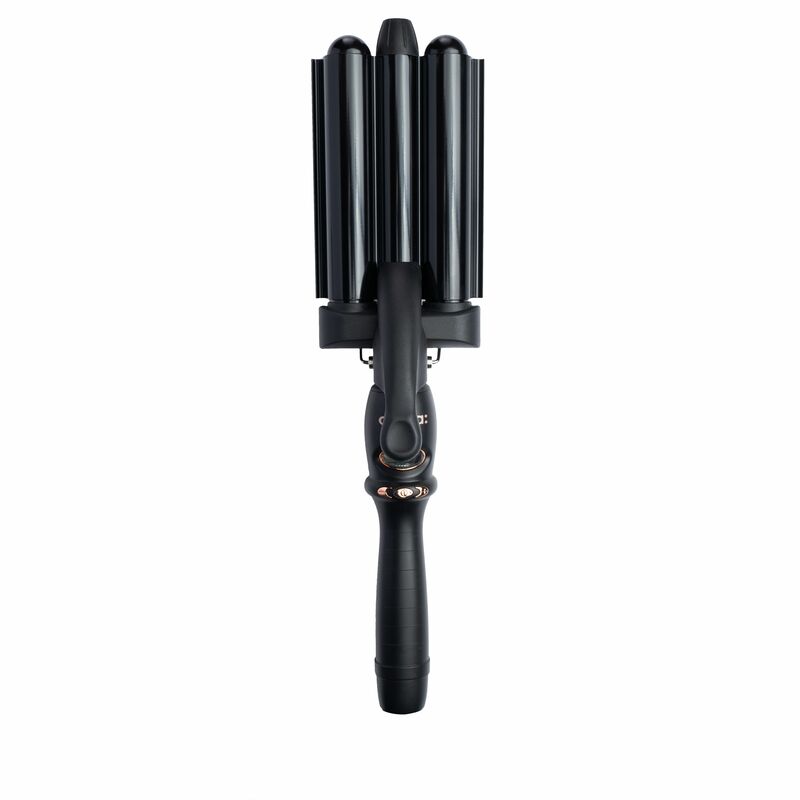 The High Tide Deep Waver is an essential for quick, frizz-free beach waves that will last through your entire day. No need to worry about precision while you style – the unique design of this tool ensures a crease-free finish. Simply separate your hair into medium-sized sections, press the barrels onto the hair and viola! Perfect beach waves with none of the sea-salt spray or the hassle. This product is quick and lightweight, making it perfect for a go-to morning styler. This product is a holy grail for all Floridians. The Anti-Humidity Spray, The Shield, acts as both an environmental protectant and a styling hairspray. This two-in-one product cuts down on time by allowing you to tackle multiple problems with one spray. Not only does it fight humidity and block dirt with a time-release weightless barrier, but it also holds your style for over 24 hours and works all day to repair any damage your hair has suffered. The Lifestyle team decided to put these products to the test. We tried it out on shorter, naturally curly, very thick and coarse hair. This hair was also chemically treated, so it’s important to be careful what we use in terms of heat in order to avoid damaging it further. Since this was thick hair, we used the recommended heat of 390 degrees with the High Tide Deep Waver. We prepped the hair by spraying it with the Fluxus Touchable Hairspray, since that can be used as a heat protectant prior to styling. Then, we separated it into sections, placed the waver over each individual section and held it there for just a few seconds before moving it. The movement you use when styling with this product is similar to that of a crimper, since the barrels are meant to clamp down onto the hair. Once we finished using the waver on all the sections (which only took about three minutes), we finished it with The Shield Anti-Humidity Spray. Since we live in Florida, the weather is usually pretty humid, so this spray ensures that the style will stay in place and refuse the frizz that it naturally tends toward. The final product was beachy, natural waves. Our team was thrilled with how easy this product was to use, and even more excited when we realized how fast the process of using it truly is. This whole style only took about five minutes total. For more information on these products or to purchase them yourself, visit sephora.com or loveamika.com.